Wherever you decide to go this summer, making snacks ahead of time is a great (and yummy) way to keep your travelers happy and save some money. That said, we know preparing for a road trip can be hectic, so we rounded up are 5 favorite snacks that are quick to make, easy to pack and won’t make a gooey mess in the car. Shake it up and you’re good to go. This snack mix comes together in minutes and will quell any road trip munchies. Chopped dill and lemon pepper add freshness and tang to this snack. Baking the mixture prevents the crackers from getting soggy and brings out all that flavorful goodness. I’m sure you can sense a theme forming here: snack food + Ranch seasoning = delicious. This seasoned popcorn is especially great if you’re looking for a lighter snack. Bonus: It’s a fraction of the price of store-bought flavored popcorn. Everybody wins! 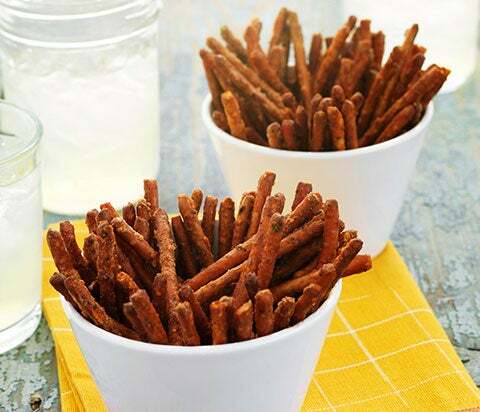 If you’re looking for a spicier snack, these pretzels are remarkably delicious and can keep for up to 2 weeks. Maple syrup is the secret ingredient here. The sugars caramelize in the oven, leaving you with a nut mix that’s sweet, salty, tangy and crunchy all at once.